As I mentioned yesterday, the new Fedora has a new neon sign. The old sign, rusted and hand-painted is gone. The new sign is a replica, a reasonable facsimile thereof, minus the rust, the dings, and the obvious brushstrokes of a long-ago hand. Thomas Rinaldi, author of a forthcoming book on neon signs in New York City, spotted the new sign and offers us a comparison with the old. 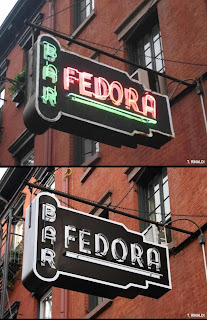 What made the old Fedora sign important to you, as a neon historian? I've never been called a neon historian before, but if the shoe fits... There are a number of things that fascinate me about signs like the one that used to hang in front of Fedora. For one thing, they've become increasingly rare, especially as the city has changed so much in the last decade. For another, there's something almost miraculous that an object so fragile could survive so long in a relatively hostile environment, against the odds. Most of all, a good old sign usually indicates a good old business behind it, a place as seasoned by time as the weathered old sign out front--the kind of place that I, for one, really like to seek out. 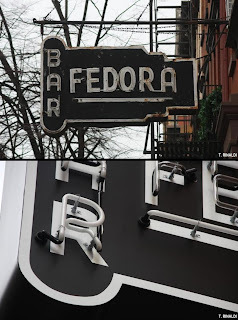 Fedora's neon sign lasted at least 65 years or so (its exact provenance has eluded me, and I even asked Fedora herself). It was something of a living fossil. The original sign was hand painted on galvanized sheet metal, with a black background beneath a white border and white sans-serif letters, highly typical of many NY neon signs of the mid-1930s (like the sign for Rudy's Bar and Grill, installed in 1937). The slightly awkward kerning of the letters FEDORA and the placement of the electrode housings is the tip-off that this was almost certainly re-lettered (not unusual). At risk of over-simplifying, kerning is a typographical term for the spacing between pairs of letters. 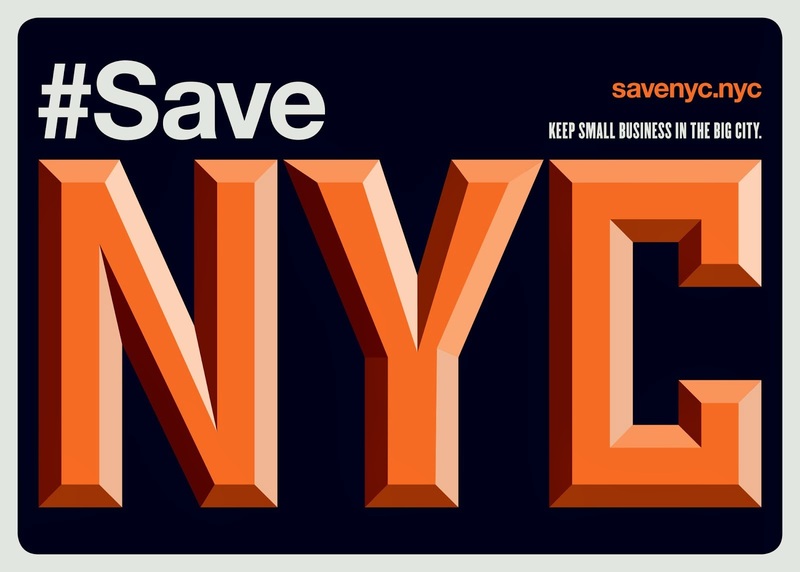 A more thorough explanation on the subject can be found at ilovetypography. In your opinion, how did the new owners do with the replication? The replicated sign actually carries over the awkward kerning of the original--more than can be said of the hatchet job they did at the Film Center Cafe, which hardly counts as a replica. If the faces had been porcelain enamel, they could have been more easily installed over a new framework (like Let There Be Neon did with its first-class restoration of the Old Town Bar sign). The new sign looks pretty good but it is completely without the patina of the old one. The same was done over at the Village Vanguard a few years ago. What would you have liked to see them do differently with the sign? Who knows, maybe they moved the original indoors for safekeeping, Statue-of-David-style. Otherwise, seems to me they could have been able to reuse at least some of the original materials, certainly the neon tubes themselves--or fabricate the replica out of the same materials as the original. The new sign is a thing entirely without the weathered character that the old sign had spent 60-odd years building up! And the new sign, though I wish it a long life, will not weather the way the old one did, because it's made out of different materials. Particularly in the context of what's happened with the restaurant itself, it makes for an interesting little case study in the value of patina and authenticity in the streetscape, no? *UPDATE: Fedora's new owner writes in to explain the sign change: "We tried extremely hard to keep the old sign. In fact, we used the same company that has been servicing the sign for the last 40 years. We had them first come and attempt to just service the neon lights. However, once up there examining the sign they urged me to replace the entire sign. The old sign had suffered so much rust damage they informed me that it was at a major risk of falling apart in the near future. And that if I left it, it could potentially cause damage to the building or to a person if it fell. The rust was so extensive, one could push their finger with hardly any pressure through the sign and parts would flake off and crumble. We have saved the old sign and intend to use it somewhere, somehow." Fascinating... and I love the awkward kerning... Now, for the real worry: What the inside will look like ... I don't have much hope. I don't know why they replaced the original with a new look-a-like with no color or history behind it. When I talked with Fedora before it closed, the one thing she said the owners promised is that they would keep the old sign. Maybe they'll put it inside, I won't know because I'm not going there again. I look forward to Thomas' book, I love neon signage. I really wish you would do a little bit of fact-checking. Yes, it is a new sign. And yes, Gabriel did say he would keep the original sign. However when they went to touch it up, the found it was so rusted, rotten and beyond repair. Truthfully, over the past few years, isn't that how Fedora the restaurant was? The original pine floors in part of the restaurant were rotten, should he have kept those? The kitchen walls were in such a state of mold and decay, they needed to structurally replace an entire part of the space. The sign had been neglected for many years. Fedora used to periodically have it repainted and fixed, but that hadnt happened for at least 15 years. So what would you have had them do about a sign that was in such bad shape? Perhaps you should have done some interviewing of the owners and the Doratos, and you would have at least presented a piece that shows both sides. Your blog presents itself as being factually accurate, and I am tired of reading things that are so skewed. @Anonymous 11:44am: How can a working sign be "beyond repair?" To say it couldn't be fixed is ludicrous, it was lit and working till they took it down. How do you "fix" something that isn't broken? Oh, wait, you just tear it all down and throw it away. I see. i just added an email from Gabriel Stulman explaining the sign change. and, happily, the old sign is being preserved. Anon, there is nothing "skewed" in the post. it states simply that the sign has been replaced with a replication, and Mr. Rinaldi gives his opinion of the change, which is a mostly positive, and also wistful, one. It's sad that business owner sometimes don't understand the value of old and instead think old=bad. The old sign, as Thomas said, has many advantages in terms of branding. Who knows maybe they even might bring back the old sign if they read this post. Amazing; that in a comparative analysis, this person couldn't get two "actual" comparative photos to compare. I mean really... how hard would that be? You have a photo of the old one lit up; take a picture of the new one lit up. Sheesh. I consider myself a preservationist. It's what I do; it's how I live. Your comment is naive and moronic. The old sign has been serviced and repaired over the years by the same company that made it. It was originally made for the restaurant that rented the space before it was Fedora...the name escapes me, Something and Jerry's. 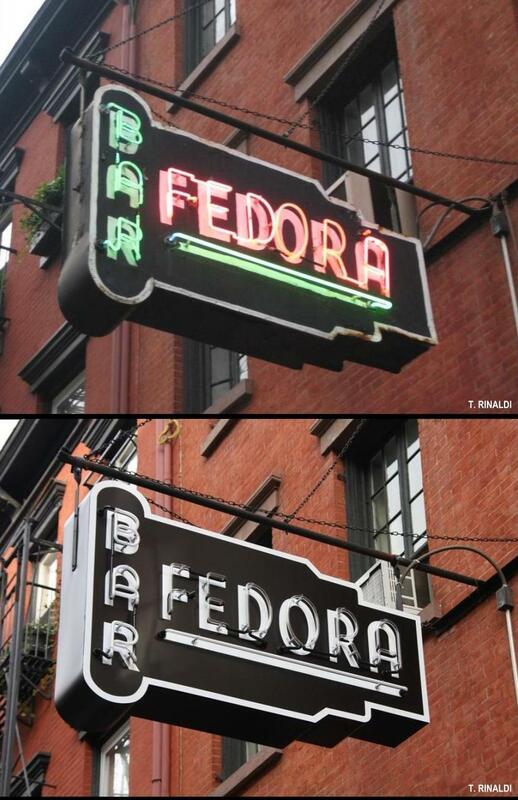 When that restaurant folded, Fedora refitted the sign. The intent was to restore it. When it was taken down, the metal was so rusted, that it was literally like dust. The metal actually fell apart underneath the hands of the crew taking it down, as though they were holding old paper. Crumbled. So yes, the neon was functioning, but the metal sign itself was actually an accident waiting to happen. Unfortunately over the years, it was badly neglected. So, the very same company that created the original, created the new one. Im not sure you can really argue with that? But does anyone know that company's name? Just curious. I liked the old sign!! I hope more people rehab old signs rather than make new ones!! !